Home to Britain’s most-loved theme park and the world’s first CBeebies Land with great kids attractions; white-knuckle roller coaster rides; special events; and much, much more; Alton Towers Resort is the perfect destination for the whole family! The park is open for the main season between 22 March – 09 November 2014 – that means 225 action-packed days – visit the Alton Towers Resort today! 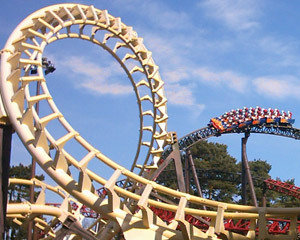 Offering an unrivalled selection of theme park rides and attractions for the whole family, Alton Towers is the UK’s leading theme park and short break resort. The origins of the Towers themselves date back to the 8th century, although the theme park and hotels are slightly less historic! The Theme Park opens from late March to early November. You can get there from the Alton Towers Hotel by following the picturesque Woodland Walk which takes only 15 minutes, and is open from 10.00am to 12.00 noon, or you can hop on the monorail next to Splash Landings Hotel, which is open from 8.30am. A selection of Theme Park rides and attractions are open during Christmas Breaks at the Alton Towers Resort, providing a magical short break for all the family during the festive season. Santa’s Lunches are available on selected dates throughout December from just £21.50 per child and £29.50 per adult – includes entry to our famous Theme Park and our wonderfully wackyWaterpark. If you have pre-purchased a Theme Park and Hotel package – or if you have purchased tickets to the Theme Park as a hotel guest on the day – you can access some of Theme Park’s most popular rides and attractions – a full hour before the Theme Park opens to the public!